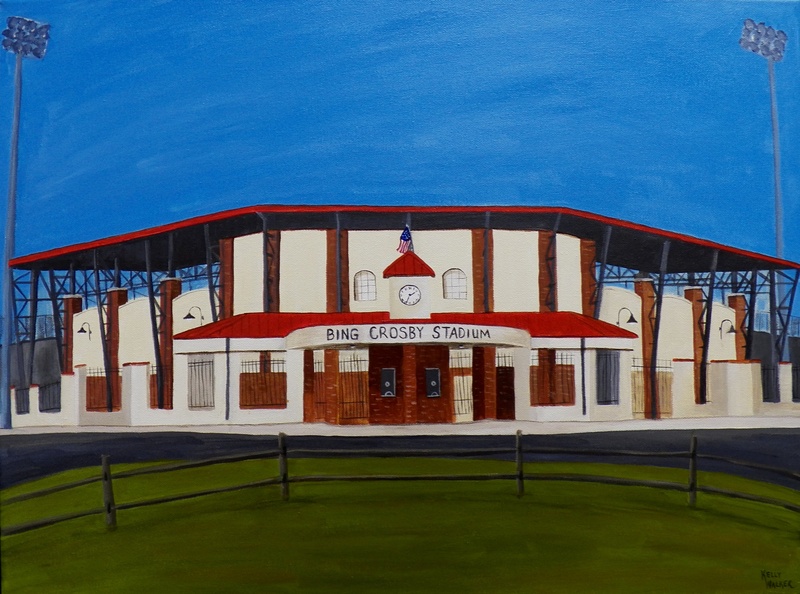 Bing Crosby Stadium | "A Place for Learning"
And for those who love local baseball, how about a print of THE BING!?! Prints of Bing Crosby Stadium are also ready. Perfect for the local baseball fan. Contact kwalker@doubledogdesigns.com to get yours today. I couldn’t paint all those ball parks over the last six months and not include our very own “Bing Crosby Stadium”. So number 31 in my series of Painted DIamonds is The Bing, as it is affectionately known in Front Royal. It opened in April of 1950 and is the home to the Front Royal Cardinals, a collegiate summer baseball team. In 1948, while serving as Grand Marshall of the Apple Blossom Festival in Winchester, Bing Crosby came to Front Royal at the invitation of Senator Raymond R. Guest to help with a fund-raising campaign for a new ball park. He contributed $1,000 to the effort. In 1950, Mr. Crosby returned to Front Royal for the premiere of his movie, “Riding High”, and made another contribution of $3,572.92, which completed the fund-raising campaign.